Sheryl Gascoigne has become the first contestant voted out of I’m a Celerity, leaving Gillian McKeith in the jungle to face her ever-growing list of phobias. Gazza’s ex was the first casualty of the public vote, butsheadmitted she was relieved to be out. Speaking to Ant and Dec, she said: ‘There’s only so much damp and darkness and wet towel you can take. When asked about Gillian McKeith and her reaction to the Bushtucker trials, Sheryl admitted that ‘it’s entertaining to watch her’. She said, ‘I really don’t believe she knew what she was getting into. She said she’d never seen the show. She was absolutely so mad about being covered in bugs. Gillian was tipped as the bookies’ favourite to leave last night but Sheryl ended up in the bottom two with Dom Joly. 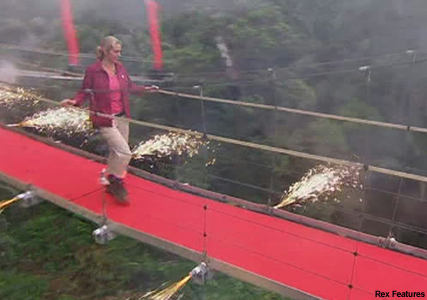 During her time in the jungle, Sheryl took on two Bushtucker trials – Terror Vision and Calamity Cave. But she had opted out of a solitary confinement task overnight that would have given her immunity from the public vote. Sheryl told Ant and Dec , ‘All day today I already knew in my mind that’s what I wanted to do. I don’t want immunity. ‘That I still want to be up for the public vote not that I thought I’d get out the quickest but I just didn’t want to take the chance. I don’t want to win immunity. Sheryl tipped X Factor reject Stacey Solomon to be crowned Queen of the jungle at the end of this series.